There’s a new comic out this week. In many respects it is rather unusual. It isn’t American or colour or interrupted by Sea Monkey ads. The protagonists eschew lycra. No female characters are scantily clad. Only one gunshot is discharged and the number of punches can be counted on one fist. WAIT! Come back! It’s a new comic! It’s funny! And also rather mysterious! Based on a popular BBC radio series! It’s The Scarifyers issue 1 and people have said it’s very good. Being the artist I couldn’t possibly say that myself, it just wouldn’t be British. However, I can tell you I worked very very hard on it, and I had a great script from the series creator Simon Barnard. Simon created The Scarifyers about 5 years ago, as an audio series which continues to be the main platform for the adventures of Messrs Lionheart, Dunning and Crow. But when we first met at Bristolcon 2011 he revealed a plan to make a Scarifyers comic. I was enthusiastic – having heard The Magic Circle on BBC Radio 4 Extra I could see the stories were robust enough to work in different formats – and before long Simon sent me a script which had me itching to draw. I must admit, I thought a comics script by a radio writer would need a bit of tweaking to work well in a visual medium, but in his adaptation of The Nazad Conspiracy Simon seemed to instinctively understand what would and wouldn’t work. All the Scarifyers CDs benefit from handsome cover art by Garen Ewing, the very talented writer/artist behind The Rainbow Orchid among other things. I took Garen’s elegant ‘ligne claire’ style as the starting point for the look of the comic strip itself, but I knew the darker moments of the story would need light and shade not normally associated with this kind of illustration. I looked at Blake & Mortimer, Hellboy and The Iron Wagon while I was developing the style of the strip and Simon pointed me towards parts of my own Bristol Story artwork which he thought worked well. I felt that the 1930s period would be better evoked if the pages themselves looked old. I used halftone screens for the greys to mimic older printing technology and even scanned in dozens of pages of blank paper to provide a range of newsprint rough paper textures! In the end, these background textures were abandoned but a slight texture was retained for the black areas. Garen’s covers used the likenesses of The Scarifyers lead actors Terry Molloy and Nicholas Courtney as starting points for his portrayal of Professor Dunning and Inspector Lionheart. I began the same way. This is the first drawing I made in preparation for Scarifyers issue 1, a fairly close likeness of Nicholas Courtney, but the more I drew the more Lionheart the character replaced Nicholas the actor. I was delighted with the reaction at Bristol. I sold a lot of copies and talked to many fans of the radio series who were pleased to see a new format for The Scarifyers. I also had the pleasure of showing the comic to Garen Ewing for the first time. A week later Simon and I manned the Scarifyers table at Kapow! Comic Convention in London. I have to say this was the most positive convention experience I have ever had. I came away from the conventions feeling very grateful and excited by the reaction to the new comic. I hope it does as well as these events suggest it will. I’d certainly love to draw more! I’m at Kapow! primarily for Scarifyers but as well as the original art, I’ll have some postcard-sized prints with me in a stop-me-and-buy-one style. They are: ‘Lucien’ my Serge Gainsbourg portrait after Lucian Freud, Adam West, The Skarasen from Doctor Who: Terror of the Zygons and the Siren from Doctor Who: The Curse Of The Black Spot. I have to say, horses are hard work to draw. 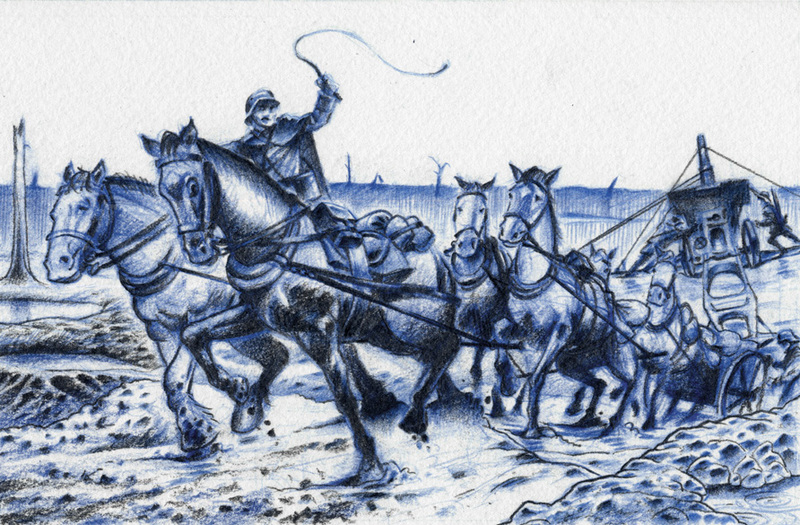 A single image was difficult enough, I dread to think what a comic about a six-horse gun team would involve! There’s no obligation to buy, if you’re interested enough to come over and have a look I’m more than happy to show you. I should be easy to spot thanks to this rather smart, Garen Ewing-illustrated banner from Cosmic Hobo (the people behind The Scarifyers in both comic and audio adventure form). 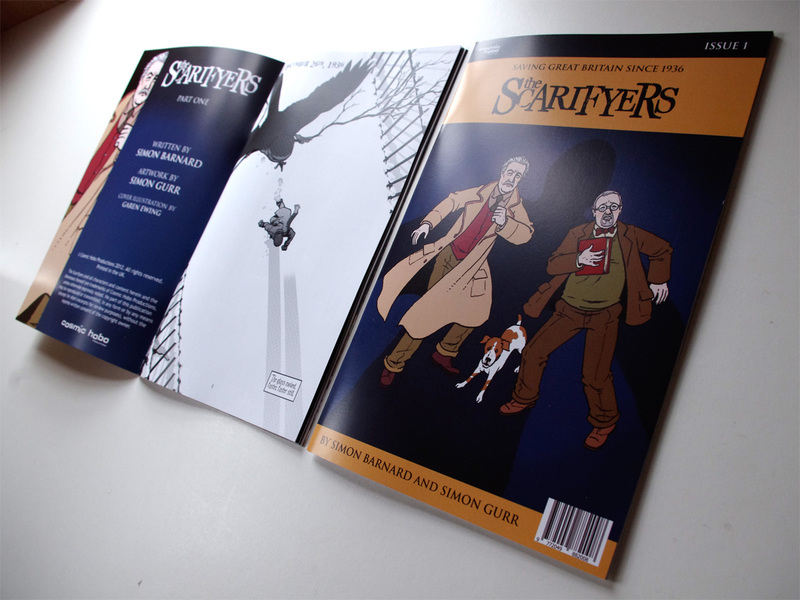 The Scarifyers issue 1 – Bristol Expo is the first place you can buy this 32-page comic, based on the BBC radio series. Written by series creator Simon Barnard, with interior artwork by me and a beautiful colour cover by Garen Ewing, this instalment tells the story of DI Lionheart and Prof. Dunning’s first meeting. All the original art from the first issue. 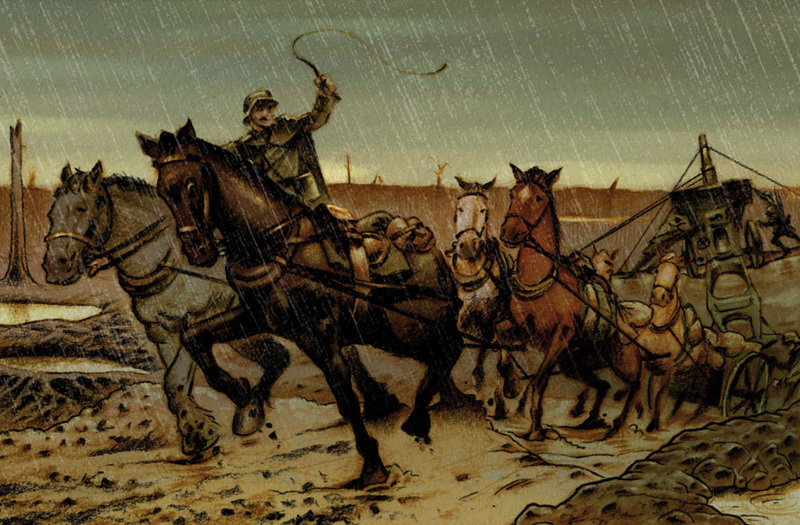 Character designs and behind-the-scenes artwork from the making of the comic. Raffle tickets. Yes, anyone buying The Scarifyers issue 1 from me this weekend will be entered into a daily prize draw, with a CHANCE OF WINNING EITHER THE LATEST SCARIFYERS CD, The Horror Of Loch Ness starring David Warner & Terry Molloy, OR A PAGE OF ORIGINAL ARTWORK! There will also be a few copies of 200-page graphic history epic The Bristol Story, by Eugene Byrne & me. And, appropriately enough for the Expo venue of Brunel’s Old Station, I’ll have my Brunel postcards and copies of Brunel: A Graphic Biography. I’ll be drawing all weekend so if you want anything sketched or signed, just come and say hi. I’m the one in the Professor Dunning costume! It’s always nice to be able to blog about big, exciting news. I’ve been working hard on the first issue of a brand new comic which is at the printers now and will be available to buy in just a couple of weeks at Bristol Comic Expo, then at Kapow! a week later available from the Bafflegab shop. That comic is THE SCARIFYERS issue 1, written by series creator Simon Barnard and sporting a very handsome cover from ligne claire legend Garen Ewing.